Gibby’s Field. Gibby’s Field is an unspoiled green space in Kensington–Cedar Cottage. It is meadow-like, covered with grass, some trees, and other vegetation, and contains a section of a lost Vancouver stream, Gibson Creek. Its stream bed winds back and forth like a snake across Gibby’s Field. Gibby’s Field is on three city lots: 1454, 1458, and 1462 East 18th Avenue (and seemingly not 1460 which is mentioned in some online documents). The former stream extends from a culvert in the southeast (on the 1462 East 18th lot) down to a culvert in the northwest (the 1454 lot). Tyee Elementary School, 3525 Dumfries Street, is just south of the lots, across a back lane. The lots are owned by the Property Endowment Fund of City of Vancouver Real Estate Services. The city has owned the lots since 1915, if not before. The three lots have never been developed, though a large (42-inch) sewer runs north-south under the west side of 1462, so it and part of 1458 were likely dug up when the sewer was constructed, which was likely during the years 1914-15 (cf. Keeling, 2001). Moses Gibson. “Gibby” was the nickname for Moses Gibson, who was a prominent citizen in Cedar Cottage from the 1890s until his death on 23 July 1937 (BC Archives) at the age of 87. Gibson was born 17 March 1850 in Ireland. He emigrated to Canada in 1873 (1901 Canada Census), to Shelburne, Ontario, where he married. He and his wife Jane had ten children (Hamilton, 1957) between 1877 and 1898 or 1899 (Census). The Gibsons moved to Vancouver in 1886 and Moses ran the Queens Hotel on Water Street in Gastown until he sold it in 1893 (Hamilton, 1957; Reid et al., 1968). The same year, he bought three district lots (748-750) in Cedar Cottage for $1,751 each, and at one time owned two other district lots near what became Main Street. District lots 748-750 comprised almost 19 acres, formed a rectangle bounded by Knight Road, 18th, Bella Vista, and 20th (Hamilton, 1957; Levitan & Miller, 1986), and came to be known as the “Gibson Ranch” (Hamilton, 1957). 20th Avenue was known as Gibson Road until December 1910 (Walker, 1999). At the time Gibson died, he owned just a single city lot (Reid et al., 1968), probably the lot where his home was situated. Gibson set up a dairy farm and lived at 1215 East 20th Avenue (the modern equivalent of 1215 is likely 1415). Gibson and one of his sons, Isaac, sold milk to people in the community. Gibson served as a councillor for South Vancouver in 1893 (Walker, 1999), which only came into existence in April 1892. Gibson was also in 1894-95 the secretary and one of the first three trustees of the one-room D.L. 301 School built in 1894. The school was located on what is now 20th Avenue between Clark and Inverness (Keeling, 2001). Moses Gibson was retired by 1911. By 1930, local people were referring to the lots on East 18th as “Gibson’s Field”, even though Gibson no longer owned them (Reid et al., 1968). Long-time Cedar Cottage residents Gordon Stevens and Velma McKinnon, who attended Lord Selkirk School in the 1910s, referred to “Gibbie’s Field” (Levitan & Miller, 1986) rather than “Gibby’s Field.” However, long-time Cedar Cottage resident Olive Cairns, who was born in 1918, recalls local children calling Gibson “old man Gibby” (Smedman, 2006). Gibson Creek. The main creek that crossed district lots 748-750 came to be known as “Gibson Creek” (Reid et al., 1968). According to Huck (1980), Gibson Creek was joined by a tributary, Davy Creek, immediately south of Gibby’s Field. Long-time resident Elsie Lockhart (2006) says that Gibson Creek ran through the Tyee Elementary School Site, which was undeveloped from 1949, when she moved into the area, until the school was built (it opened in 1973). Lockhart has no recollection of Davy Creek (it may have been culverted by 1949). Gibson Creek crossed Kingsway at Knight, the site of the old Cedar Cottage Brewery, which used the creek’s waters. Cairns recalls a number of Chinese gardens on the east side of Knight, south of Kingsway, “because … the soil was good and there was a stream there”. The stream was Gibson Creek. The following map from East 17th Avenue and East 26th Avenue depicts Gibson Creek and Davy Creek. Some locations are approximate; some lanes have been omitted. 1: Gibby’s Field (1454, 1458, and 1462 East 18th Ave [new house numbering]). 2: Former home of Moses Gibson (1215 East 20th Ave [old numbering]). 3: Former home of Margaret B. and George W. Hubbard (1226 East 20th Ave). 4: Tyee Elementary School (3525 Dumfries St). Red (grey) dashed lines: District lots 748-750 once all owned by Gibson. Green (grey) areas: Undeveloped or park land, circa 1959 (cf. Macdonald, 1992). 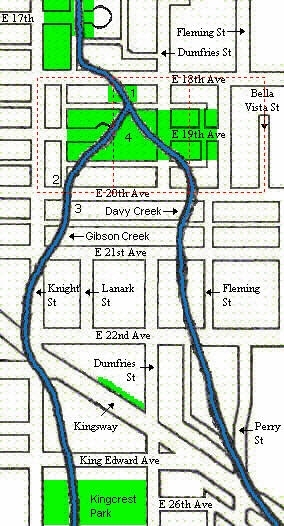 Nowadays, Gibson Creek passes in culverts under two Kensington-Cedar Cottage parks: Kingcrest Park (4150 Knight Street at East 26th Avenue) and Kensington Park (5175 Dumfries Street at East 37th Avenue), formerly known as Union Park until 1961. The latter park has existed since 1930 if not before (cf. Steele, 1988). In 1926, Gibson Creek ran through the area of the park as an open stream. It is not clear when this section of Gibson Creek was culverted. The headwaters of Gibson Creek are just south of 37th Avenue and just east of 5300 block of Dumfries Street (Dumfries is two blocks east of Knight). Hamilton, Reuben (1957). Mount Pleasant Early Days: Memories of Reuben Hamilton, Pioneer, 1890. Vancouver, BC: City of Vancouver Archives. Huck, William F. (1980). Vancouver Old Creeks. Vancouver, BC: unpublished map. Keeling, Arn (2001). Gibby’s Field Final Research Report. Prepared for Gibby’s Field Group by Arn Keeling. 29 September 2001. Vancouver, BC: Unpublished manuscript. 7 pages. Levitan, Seymour, and Carol Miller (Eds.) (1986). Lucky to Live in Cedar Cottage: Memories of Lord Selkirk Elementary School and Cedar Cottage Neighbourhood 1911-1963. Vancouver, BC: Vancouver School Board. Lockhart, Elsie (2006). Telephone interview by Dan Fass. 18 October 2006. Macdonald, Bruce (1992). Vancouver: A Visual History. Vancouver, BC: Talonbooks. Reid, Glen, and Alan Lysell (Eds.) (1968). The Days Before Yesterday in Cedar Cottage. Craig Reid, Patricia Little, and Tommy Fung (Researchers). Produced and bound at Vancouver, BC: Gladstone Secondary School. Smedman, Lisa (2006). Remembering Knight Street’s Quieter Days. Vancouver Courier, Friday 11 August 2006, Vol. 97, No. 65, pp. 18-19. Steele, R. Mike (1988). The Vancouver Board of Parks and Recreation: The First 100 Years: An Illustrated Celebration. Vancouver, BC: The Vancouver Board of Parks and Recreation. Walker, Elizabeth (1999). Street Names of Vancouver. Vancouver, BC: Vancouver Historical Society.